The domain within your query sequence starts at position 36 and ends at position 158; the E-value for the SynN domain shown below is 7.58e-27. Syntaxins are the prototype family of SNARE proteins. 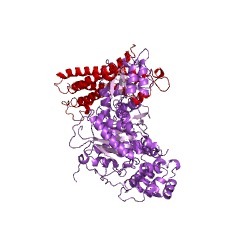 They usually consist of three main regions - a C-terminal transmembrane region, a central SNARE domain which is characteristic of and conserved in all syntaxins and an N-terminal domain that is featured in this entry. 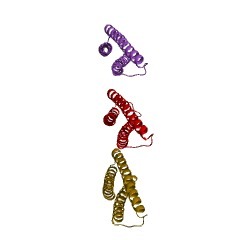 This domain varies between syntaxin isoforms; in syntaxin 1A (O35526) it is found as three alpha-helices with a left-handed twist. 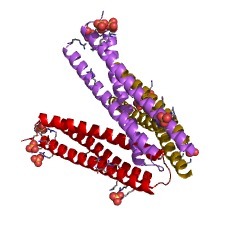 It may fold back on the SNARE domain to allow the molecule to adopt a 'closed' configuration that prevents formation of the core fusion complex - it thus has an auto-inhibitory role. The function of syntaxins is determined by their localisation. 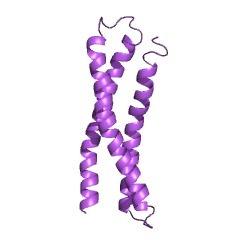 They are involved in neuronal exocytosis, ER-Golgi transport and Golgi-endosome transport, for example. 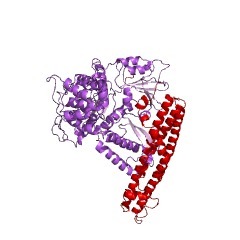 They also interact with other proteins as well as those involved in SNARE complexes. These include vesicle coat proteins, Rab GTPases, and tethering factors [(PUBMED:11737951)]. There are 5994 SynN domains in 5987 proteins in SMART's nrdb database. Taxonomic distribution of proteins containing SynN domain. This tree includes only several representative species. The complete taxonomic breakdown of all proteins with SynN domain is also avaliable. Click on the protein counts, or double click on taxonomic names to display all proteins containing SynN domain in the selected taxonomic class. Rapid and efficient fusion of phospholipid vesicles by the alpha-helical core of a SNARE complex in the absence of an N-terminal regulatory domain. A protease-resistant core domain of the neuronal SNARE complex consists of an alpha-helical bundle similar to the proposed fusogenic core of viral fusion proteins [Skehel, J. J. & Wiley, D. C. (1998) Cell 95, 871-874]. We find that the isolated core of a SNARE complex efficiently fuses artificial bilayers and does so faster than full length SNAREs. Unexpectedly, a dramatic increase in speed results from removal of the N-terminal domain of the t-SNARE syntaxin, which does not affect the rate of assembly of v-t SNARES. In the absence of this negative regulatory domain, the half-time for fusion of an entire population of lipid vesicles by isolated SNARE cores ( approximately 10 min) is compatible with the kinetics of fusion in many cell types. Membrane fusion: all done with SNAREpins? SNARE proteins are sufficient to fuse artificial membranes together. In the cell, vesicle transport may rely on fusion mediated by interaction between vesicle (v) and target (t) SNAREs, whereas the homotypic fusion of organelle biogenesis may be mediated by t-SNARE-t-SNARE interaction. 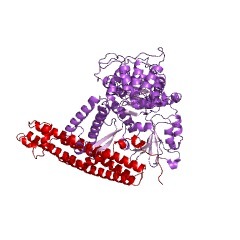 Three-dimensional structure of an evolutionarily conserved N-terminal domain of syntaxin 1A. Syntaxin 1A plays a central role in neurotransmitter release through multiple protein-protein interactions. 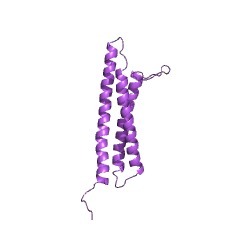 We have used NMR spectroscopy to identify an autonomously folded N-terminal domain in syntaxin 1A and to elucidate its three-dimensional structure. This 120-residue N-terminal domain is conserved in plasma membrane syntaxins but not in other syntaxins, indicating a specific role in exocytosis. The domain contains three long alpha helices that form an up-and-down bundle with a left-handed twist. A striking residue conservation is observed throughout a long groove that is likely to provide a specific surface for protein-protein interactions. A highly acidic region binds to the C2A domain of synaptotagmin I in a Ca2+-dependent interaction that may serve as an electrostatic switch in neurotransmitter release. 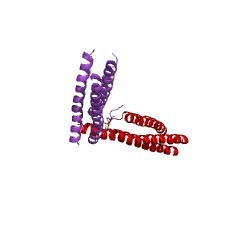 Regulation of SNARE complex assembly by an N-terminal domain of the t-SNARE Sso1p. The fusion of intracellular transport vesicles with their target membranes requires the assembly of SNARE proteins anchored in the apposed membranes. Here we use recombinant cytoplasmic domains of the yeast SNAREs involved in Golgi to plasma membrane trafficking to examine this assembly process in vitro. Binary complexes form between the target membrane SNAREs Sso1p and Sec9p; these binary complexes can subsequently bind to the vesicle SNARE Snc2p to form ternary complexes. Binary and ternary complex assembly are accompanied by large increases in alpha-helical structure, indicating that folding and complex formation are linked. Surprisingly, we find that binary complex formation is extremely slow, with a second-order rate constant of approximately 3 M(-1) s(-1). An N-terminal regulatory domain of Sso1p accounts for slow assembly, since in its absence complexes assemble 2,000-fold more rapidly. Once binary complexes form, ternary complex formation is rapid and is not affected by the presence of the regulatory domain. 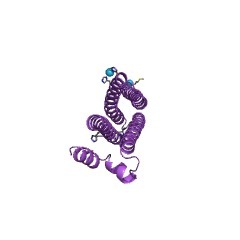 Our results imply that proteins that accelerate SNARE assembly in vivo act by relieving inhibition by this regulatory domain. This information is based on mapping of SMART genomic protein database to KEGG orthologous groups. Percentage points are related to the number of proteins with SynN domain which could be assigned to a KEGG orthologous group, and not all proteins containing SynN domain. Please note that proteins can be included in multiple pathways, ie. the numbers above will not always add up to 100%.